and it keeps things organized! makes a great gift - even for yourself! The beanbagSchooldesk is the portable desk for your lap that lets you work or play from the comfort of your favorite chair, sofa, or bed, while keeping supplies close at hand. 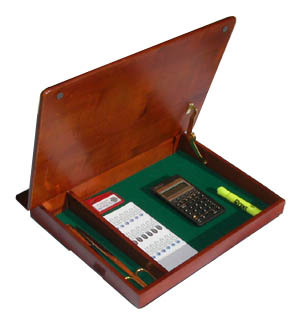 Expertly crafted, this unique product includes a large storage compartment. The lid includes a spring-loaded mechanism which holds it open until you decide to close it. Made of beautifully finished hardwood, it features a black cotton duck beanbag pillow bottom which is not only comfortable, but stays in place on your lap for writing, reading, paying bills, maybe even playing solitare! Office supplies (duh!) not included. Works great in the car!